This extended reach hedge trimmer features a short shaft, lightweight design, low-emission engine and ECOSPEED throttle control. 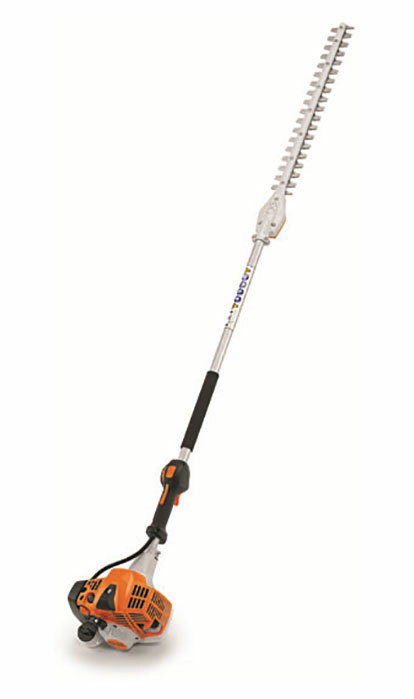 With a 40" shaft length and an array of professional features, the HL 94 K (0°) extended reach hedge trimmer is a must-have for landscapers who do hedge work for extended periods of time. Its fixed-angle trimming head delivers constant cutting power, while its reduced-weight gearbox is more comfortable to hold and easier to maneuver than previous models. The HL 94 K also features the STIHL-exclusive ECOSPEED throttle set wheel for variable speed control. This allows professionals to reduce unnecessary fuel consumption, keeping you working longer between fill-ups. Finally, rubber control handles provide a comfortable grip, letting you cut with confidence. MULTI-FUNCTION CONTROL HANDLE: Having easy access to all of the controls on one comfortable handle helps makes it easier to complete tasks so the operator’s hand never has to leave the handle.